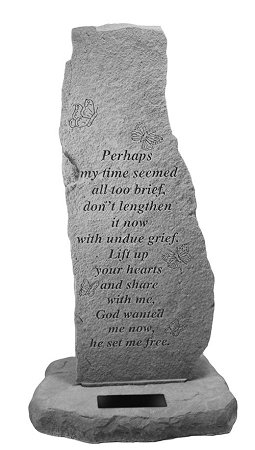 Home > Specialty > Religious Theme > Personalized Memorial Stone - Perhaps My Time Has Come.. This obelisk memorial makes a touching tribute to the special person we have lost. The memorial is made of cast stone that has a rich texture with the look, feel and weight of true stone. It is weatherproof and has year-round durability. Made in the USA. Lift up your hearts and share with me, God wanted me now, he set me free. This memorial can be personalized with up to 3 lines with a maximum of 21 characters per line. Personalization is etched on a black marble plaque. Memorial Stone, Upright - Perhaps My Time Seemed..